This panda celebrates the 75th year that Steiff has been including a panda bear in its assortment. Steiff created this bear in celebration of the 75th anniversary of the panda bear in the Steiff assortment. He is a slightly smaller reproduction of a panda from 1938, complete with the finest black and white mohair, shiny brown pupil eyes and a squeaker in his belly...just like the original. The 75th Anniversary Panda has detailed airbrushing around his eyes, his muzzle, and on his back. His nose is hand stitched and this anniversary panda features a gold plated Button in Ear. Standing almost 10 inches tall, he is 5-way jointed. 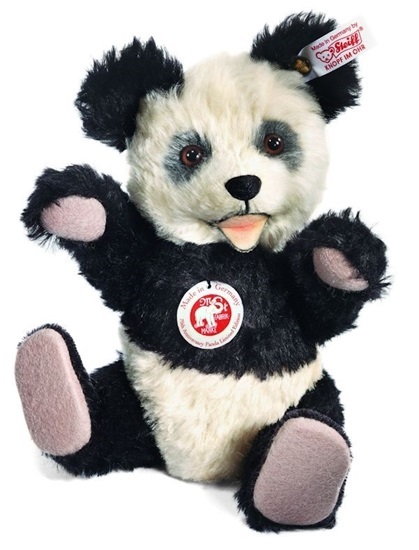 This 75th Anniversary Panda is a world wide limited edition of 1,938.